Arlington House, also known as the Robert E. Lee Memorial, in Arlington National Cemetery. Section 32 of the cemetery is in the foreground. Sometimes, good ideas threaten historic places -- and that's when preservationists and their allies look for better ideas. 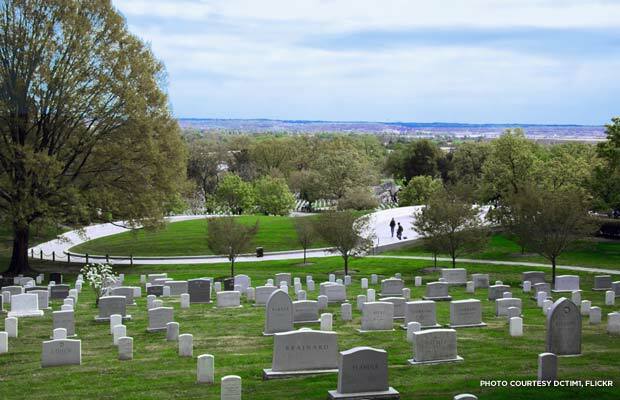 A timely example: The Army Corps of Engineers is expanding Arlington National Cemetery to meet the growing demand for burial sites. For example, the 42-acre Navy Annex site adjacent to the cemetery is being cleared right now to provide many thousands of new burial sites. No one objects to the idea of providing an honored resting place for our nation’s military veterans. To make room for still more burials, however, the Army Corps plans in 2013 to fell 1,700 trees and cut-and-fill a 27-acre stream valley in Arlington House Woods, the cherished forest surrounding the 1802 Arlington House. 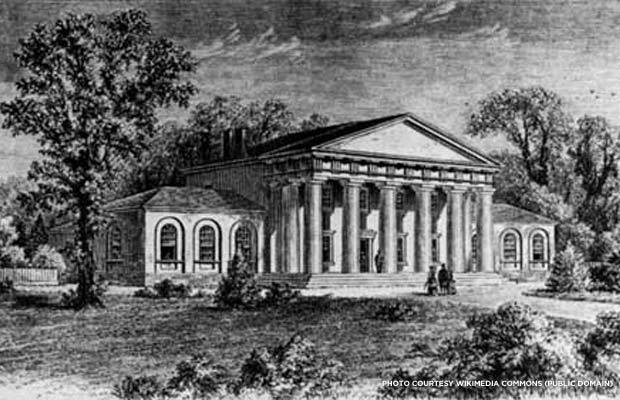 Arlington House in a sketch made before 1861. The threat to Arlington House Woods raises an interesting question that is familiar to many preservationists: When a historic place is threatened with extinction, what sort of compromise is acceptable? Should advocates fight to stop the expansion into Arlington House Woods altogether? Should the Army Corps plow ahead, ignoring the historic quality of the cultural landscape, to allow more burials at Arlington Cemetery? Or, is there a middle position which would convert some portion of the wooded stream valley for burials without losing forever the natural beauty and historic character of Arlington House Woods? Often a workable compromise can be found through creative design and a thorough exploration of alternatives. Standing on Custis Walk, looking southeast across Section 30 at Arlington National Cemetery. We are confident there are better ways to expand the Cemetery. The National Trust is urging decision-makers to return to the drawing board and develop a new, more sensitive plan to expand the burial area without destroying Arlington House Woods. We've taken direct action before to preserve Arlington National Cemetery. For example, we protected the Tomb of the Unknowns against an ill-considered plan to remove and replicate the marble monument because of a few cracks. That problem was solved when the Army Corps listened to much-needed advice from stone restoration experts. In finding a better solution for Arlington House Woods, the National Trust is joined by the Potomac Conservancy, Sierra Club, National Parks Conservation Association, Preservation Virginia, Virginia Department of Historic Resources, as well as Arlington County’s urban forestry and historic preservation commissions. Only time will tell whether our call for compromise is heeded. Until then, preservationists will strive to explore all the options and find a way to protect all the different elements that make Arlington House Woods a treasured piece of American history. The Army Corps’ destructive plan for Arlington House Woods is on a fast track for final approval, and we need you to take action today. 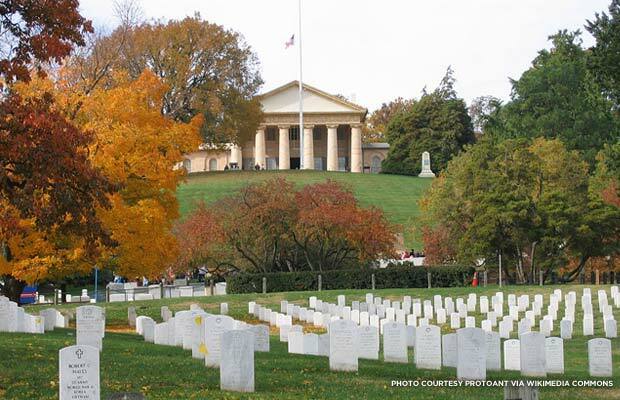 You can support preservation of Arlington House Woods by writing to Patrick K. Hallinan, Superintendent of Arlington National Cemetery, Arlington National Cemetery, Arlington, VA 22211-5003. Ask Superintendent Hallinan to expand the Cemetery without destroying Arlington House Woods. Thank you!